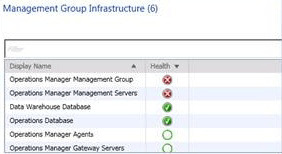 The Management Group Health view allows you to see at a glance the health state of all management group functions, such as resource pools, and the management group infrastructure, such as management servers. It also shows you recent agent health state including gray agents, agent configuration for agents pending management, and agent versions. You can display Management Group Health on a SharePoint site by using the Operations Manager Web Part, giving all authorized users a useful summary of management group status. For more information, see Using SharePoint to View Operations Manager Data. Management Group Health automatically refreshes every 15 minutes by default. To manually refresh the view, right-click the view and click Refresh. It may take some time before the dashboard starts to show data. 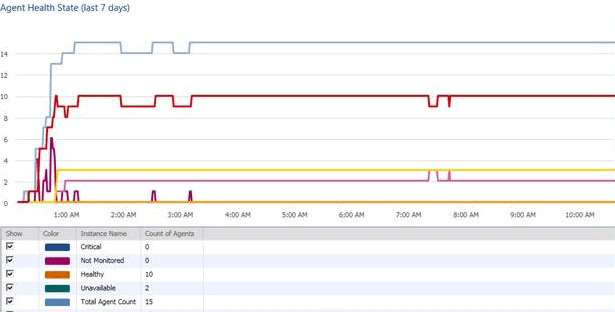 The agent data is recalculated every 15 minutes, and not when you refresh the dashboard. This topic describes the specific information you will see in each cell of the Management Group Health dashboard view. You can open Health Explorer, alert view, diagram view, event view, performance view, and state view for any of the functions listed. To open a different view, right-click the display name for the function, and click Health Explorer or Navigation. You can open Health Explorer, alert view, diagram view, event view, performance view, and state view for any of the features listed. To open a different view, right-click the display name for the feature, and click Health Explorer or Navigation. Agent Health State displays a graph of health states for all agents over the past 7 days. The screenshot for Agent Health State displays 9 hour’s worth of data. As additional data is collected, the scale will compress to show a maximum of 7 day’s worth of data. The graph captures all possible agent states, including “unavailable”, or “gray”, agents. It is possible to unselect health states, if you only want to focus on certain health states. Agent Versions lists the number of agents running each agent version number, including cumulative updates.